Welcome to the 2019 AANP National Conference Housing Reservations website! The Indiana Convention Center in Indianapolis, IN is the site for the national conference. Important Note: As a conference registrant you may be contacted by 'housing pirates' pretending to be staff from the official AANP Housing Center. They will pressure you to make hotel reservations through them. The official AANP Housing is through this site only. AANP will not contact registrants to book hotel rooms. The AANP official and only registration/housing provider is AANP Housing who is managed through Meeting Management Associates, Inc. They are authorized to assist you with housing accommodations. Please immediately call 855-857-5933 if you suspect you were contacted by a 'housing pirate' and provide as much information as possible. 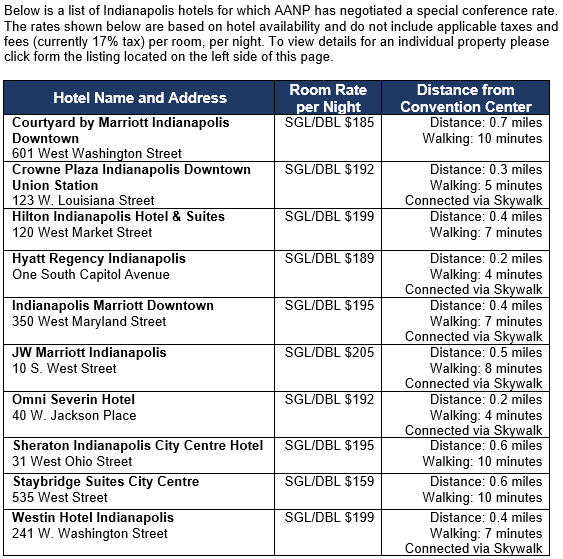 Below is a list of Indianapolis hotels for which AANP has negotiated a special conference rate. The rates shown below are based on hotel availability and do not include applicable taxes and fees (currently 17% tax) per room, per night. To view details for an individual property, please click from the listing located on the left side of this page. The AANP Housing Center is available to answer questions from 8:30 AM to 4:30 PM ET, Monday through Friday, excluding holidays.